Thanksgiving was a hit this year. It was a Thanksgiving of many firsts - the first one celebrated in our new home, the first one shared with my godparents and cousins, and the first one where my brother-in-law, sister-in-law, and their 2 awesome boys were living on the same coast and could be with us on this day. When we have people over to our home, I love to feed them. Jon's always complaining that I go overboard or make too much food, but that's how I like it. I love the preparation and planning that goes into it, and even loved making my timeline (and adjusting it three times until it was perfect). And perfect it was.... I wrote everything out with the goal of having our feast on the table by 3:00 PM. Once the food was ready and in serving bowls, I called everyone for dinner and happened to look at the clock. Yup, 3:00 on the dot. I'll be saving that timeline for next year! But before the big feast, I put out some appetizers - a nice cheese and meat plate, nuts, crackers, fruit, and one fancier app that to me was the perfect bite. This app was sweet and salty, creamy and crunchy, and surprisingly was even enjoyed by a few people I thought would never even try it. Besides all of that, it was super easy to put together, making it the perfect appetizer for a busy day. 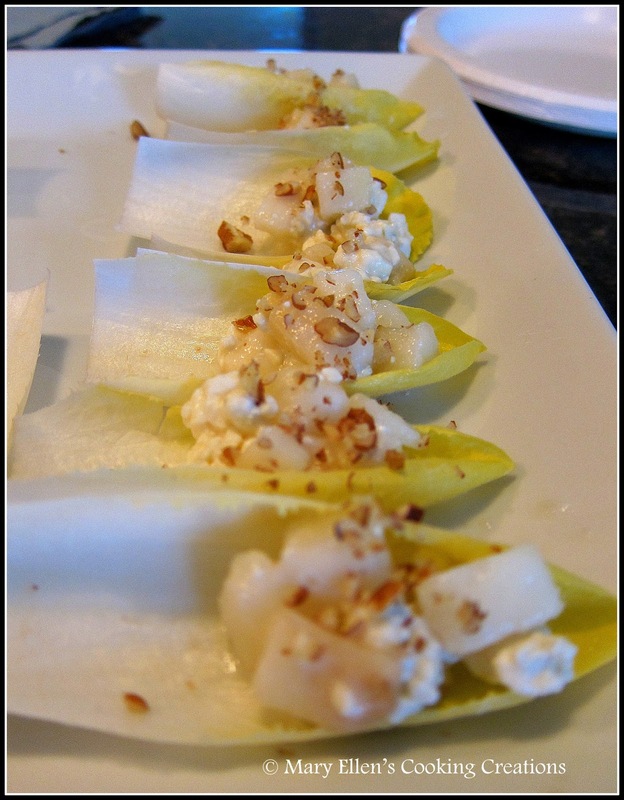 Cut off the bottom of the endive. Gently pull apart the leaves being careful not the break them. Wash and dry, again being very gentle. Mix the pear and Gorgonzola in a bowl. 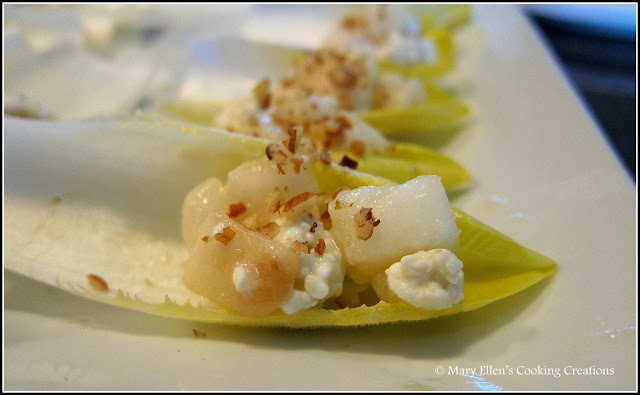 Spoon mixture into the yellow end of the endive leaves. Sprinkle with the crushed pecans. Mmm! This sounds easy and delicious, the perfect appetizer. Thanks for sharing! Mmm, this sounds easy and delicious. The perfect appetizer, thanks for sharing!